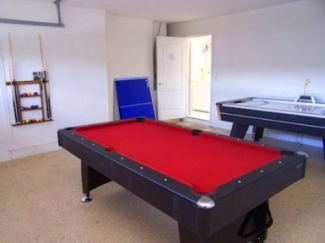 Games room with pool, airhockey tables. 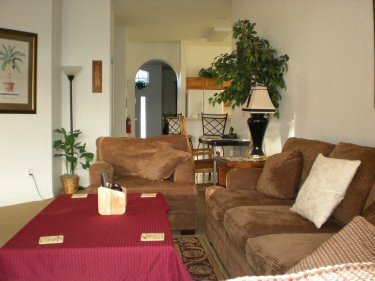 Our spacious villa is air conditioned, has a screened pool / deck area and faces a south westerly direction. It has a games room with pool, air hockey and table tennis tables. FORMAL LIVING / DINING ROOM. 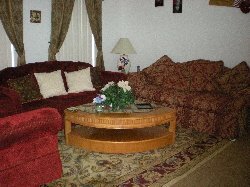 is a spacious formal living room which is furnished to a high standard. 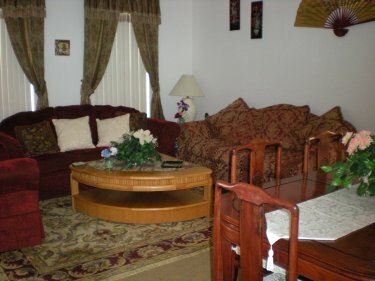 There is a separate dining area to the side of the formal living room. KITCHEN. 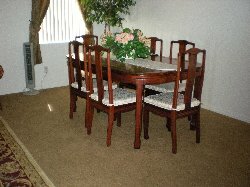 This contains a separate breakfast nook with a high table and four chairs and a breakfast bar with two stools. The fully equipped kitchen is contains a comprehensive range of appliances, including a fridge/freezer, waste disposal unit, electric cooker/hob, microwave, dishwasher, coffee maker, kettle, toaster. Also included is a large range of quality tableware, glasses and cutlery. There is variety of plastic tableware etc for use around the pool area. GAMES ROOM. Join in some family fun playing pool, table tennis,foosball,magnetic darts or air hockey. All equipment is provided. FAMILY ROOM. 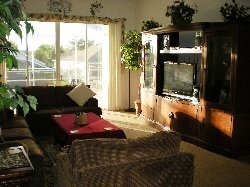 The large family room looks out onto the pool area and features a 40 inch Flat Screen LCD digital HD-TV with cable access to over 200 channels, a DVD player and a Stereo Audio system with MP3 player connection. 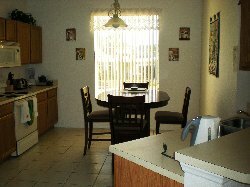 It is fully furnished to a high standard. The full size cabinet contains a selection of DVD�s and board games for your entertainment. 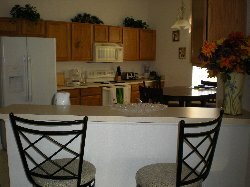 Located near the breakfast bar is the high speed wireless internet access, there is also a wired connection if required. You can also phone FREE within the USA. POOL/DECK. 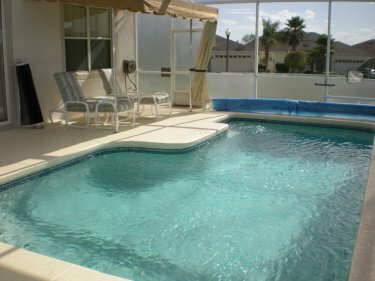 The villa benefits from a 24ftx13ft screened pool with 4 sun loungers, a patio table and 4 chairs and faces South West. The pool also has optional heating. There is also a pool safety fence. MASTER BEDROOM 1. The Master Bedroom includes a high queen sized bed with twin night stands, dressing table, telephone, a combinedDVD player /Cable TV with access to over 70 channels, a large double wardrobe with safe, and a ceiling fan. The en-suite bathroom comprises of his and hers sinks, a WC, a separate bath and walk in shower. MASTER BEDROOM 2. The second Master Bedroom features a TV with a separate DVD player,a full sized bed with twin night stands and dressing table and a large double wardrobe. The bathroom although not en suite is only a few steps away comprises single sink, WC, and walk in shower. TWIN ROOMS 1& 2.Twin room 1 features a TV, twin beds, a night stand, chest of drawers and a large double wardrobe, themed in a Winnie the Pooh style. Twin room 2 featuring aPlayStation with TV, twin beds, a night stand, dressing table and a large double wardrobe.Twin 1 and 2 share a bathroom that is situated between the two rooms is comprises a single sink, WC, bath with over the bath shower. UTILITY ROOM. contains a full size washing machine, tumble dryer, iron & ironing board. All towels and linens are provided Please note there are separate towels provided for the pool area. 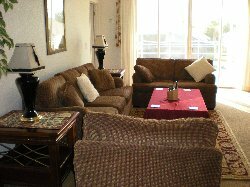 Our villa is managed by an excellent and friendly on site management team. Other equipment available is highchair, cot and bedding at no extra charge. Our villa sits on Highlands Reserve which contains its own 18 hole golf course. Discount of 10% given for 3 weeks stay or more. Cleaning charge of £80 for all stays of 5 nights or less.